Better health. Powered by information. This week we look at preparations for Wave 2, how our Patient and Family Advisory Council is helping shape Connect Care, and Alberta Health’s new MyHealth Record portal. Connect Care will be introduced in a series of phases, called “waves”. The second wave, including select sites in the Calgary and Central Zones, is now a year away from its launch date and preparations are underway. 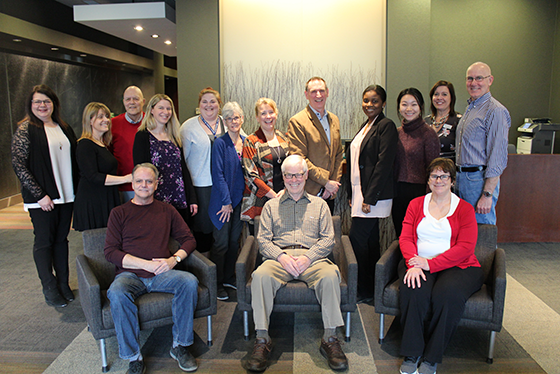 Last week, leaders and physicians from Calgary Zone rural sites gathered at the Cochrane Community Health Centre for a Leader Orientation. At the event, participants learned about Connect Care and the supports and training available as they implement the program. Interactive system displays and device demonstrations were available for attendees to get a close-up view of the system and to experience what using it is like. 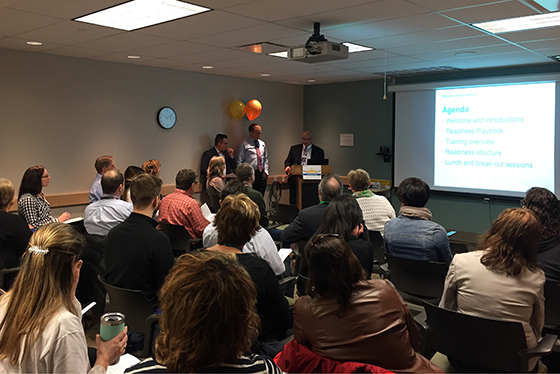 In the afternoon, Dr. Robert Hayward, Chief Medical Information Officer, presented a “day in the life of a physician” which demonstrated how physicians will use the system once it is in place next year. A similar event for the Central Zone is in the planning stages for later this spring. A recording of the presentations will be available on Insite soon. Patients – they’re at the heart of everything we do. That’s why it’s so important that they are also at the heart of our Connect Care preparations. Dedicated Patient and Family Advisors have been involved with Connect Care from the very beginning, providing support and guidance through a number of roles. One of the ways they are involved is through the Connect Care Patient & Family Advisory Council. This group of 19 members from across the province has been meeting regularly since January 2018. The group serves as a sounding board, providing feedback to various projects and pieces of work to make sure patient and family voices are represented. Their passion helps us ensure that Connect Care will truly enhance the care we provide patients. With the support of this Council, and our patient advisors overall, we are building a system that will keep patients at the centre of their own care. Alberta Health has launched its MyHealth Records portal. MyHealth Records offers Albertans access to some of their health data from the Netcare provincial electronic health record. Initially, this includes recent medications dispensed from community pharmacies, the majority of immunizations administered in Alberta and a number of common laboratory test results. MyHealth records offers a number of tools that Albertans can use to keep better track of their health such as journals for tracking mood, sleep, weight and fitness goals. It also supports the upload of health information from some personal health devices such as certain fitness trackers and blood glucose meters. The launch of MyHealth Records represents a shift in how Albertans will relate to health information and interact with their health care team, which will benefit AHS as we prepare to launch Connect Care across the province. Please visit the MyHealth Records website for more information about the service and its features. If you have additional questions or concerns, please contact myhealthrecords@gov.ab.ca. Copyright © 2019 - Alberta Health Services - All rights reserved.